A request that puts fear in the soul of all but the most confident of gardeners is “can you identify this plant/flower/weed”. This is the horticultural equivalent to the doctor’s “I have a pain in my left kneecap”, the builder’s “there is a leak in our back bedroom” and the chef’s “my cake didn’t rise”. It happens frequently and of course I do my best but it is one thing recognising something insitu, quite another in the obscure states that are demanded. Sometimes it is a photo (the combination of a phone camera and me with no specs is a recipe for disappointment), sometimes a verbal description “blue, biggish”, occasionally a real life specimen, dessicated and crumpled, pulled out of a pocket or handbag. Today I was presented with the above flower, admittedly in fine fettle, which had come as part of a florist bouquet. I failed to ask if the gentleman in question had asked permission to raid his wife’s display, I would imagine not. Anyway I didn’t have a clue, what I did know was in this instance I was also eager to find what this splendid flower was. So I did what any “moderne” gardener would do in desperation, I Googled “orange thistle” and all was revealed. This is Carmanthus tinctorius, any the wiser? 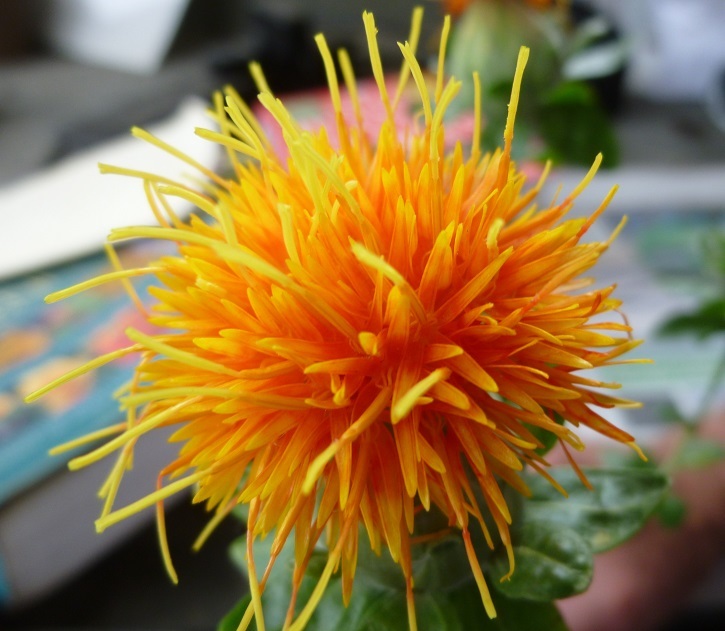 It is also known as False Saffron or Safflower, sounding a little more familiar? It is grown commercially across many parts of the world including the Americas, Asia and Australasia where the seed is used to make a vegetable oil very similar to sunflower oil. The petals are used as a substitute for saffron. There is evidence that it was used by the ancient Egyptians as a dye and is also used to colour Buddhist robes. It is also used as a nutritional supplement. So many virtues attached to one plant. This overt usefulness is all very well but let us not forget those stunning thistle like flowers which come in varieties of clear yellow, orange or red. The mystery is why haven’t I grown it yet?! ← All you need is …..
That’s a beauty, for sure! Beautiful – have just found out that seeds are available on eBay, and probably elsewhere so no excuses…..